The first recorded settlement in Colonial Heights was by Thomas Shore. In 1775, he purchased 144 acres of land along the northern bank of the Appomattox River, across from Petersburg. He built his mansion and called it Violet Bank. While the original main building was burned, this remaining structure, built in 1815, is registered as a Historic Landmark. Today, Violet Bank is on the National Register of Historic Places and is a registered Virginia Historic Landmark. In 1864, during the Civil War, Violet Bank became the headquarters for Confederate General Robert E. Lee from June to September of 1864 during the siege of Petersburg. On July 30, 1864 General Lee was at his headquarters at Violet Bank Farm on the north shore of the Appomattox River overlooking Petersburg. There, he received word that Union troops had detonated over 8,000 pounds of gunpowder beneath Confederate defensive lines in what became known as the Battle of the Crater. Today, the home is a superb example of Federal design and American interior decorative arts. The museum interprets the period from 1815 to 1873 and displays a wide array of Civil War era artifacts: guns, furniture, glass, ceramics, textiles, accoutrements, books, swords and others. 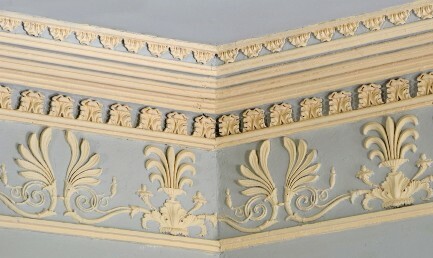 It boasts some of the most sophisticated and beautiful Adam-style ceiling moldings in the country. Admission is free, donations are accepted. Allow 30 to 45 minutes to visit. Open Tuesday through Saturday from 10:00 am to 5:00 pm and Sunday from 1:00 pm to 6:00 pm. Closed Monday. View more details about visiting Violet Bank Museum.